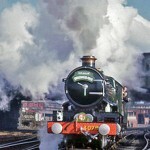 4079 leaves Chester in 1967. 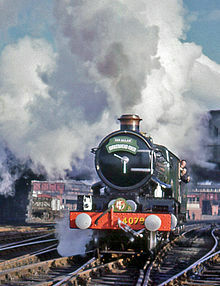 Stimulated by the imminent return to steam of Flying Scotsman, we GWR types really cannot resist wondering how good this most expensively refurbed machine will be. It should be very good, especially in terms of the money spent etc etc… but my basic question is: is this latest incarnation of Gresley’s classic design as big an improvement over the original as that which has been made to Castles in the intervening years. Put simply, is a modern, double chimneyed Castle as good as a similarly improved A3? A lot has happened since the trials in 1925 that saw our own Pendennis Castle humiliate the much bigger Gresley machine right on its home territory. Significantly, Gresley learned a lot the hard way while the GWR just spent a lot of time smirking to itself and hardly innovating at all. Later LNER express designs are all very impressive machines and I guess we GWR folk might, if we are feeling generous and being led by our heads rather than our hearts, admit that they were an advance on Mr Churchward’s revolutionary design. Or maybe not…! Because there is the phenomenon of 5043, ‘Earl of Mount Edgcumbe’. It really is the supreme example of the ultimate evolution of the 1906 GWR 4 cylinder 4-6-0 design and always outperforms its designated 7P power classification. the overused word ‘Awesome’ is entirely appropriate. The single chimneyed version we have seen recently, in the form of 5029, always seems to slightly disappoint in comparison, as indeed, it should, so will the newly out-shopped. also single chimneyed, Pendennis Castle be any better than Nunney? My impression is that Pendennis was always a better Castle than Nunney which, gossip tells me, was never really seen as being a particularly ‘good ‘un’ in GWR or BR days. We will soon know the answer to that point but surely the new Scotsman would get its revenge fairly easily over either of these in any Kings Cross rematch. But what about 5043? Could it match or even embarrass the LNER’s newest A3 again, under similar conditions? Or might it be better to wait for Clun, which would be as new as Scotsman and also with a double chimney so perhaps a better comparison? On the other hand, 5043′s BR reputation was always as a star performer and better than 7029′s so perhaps not. There is, of course only one way to find out and we all know what that is! Bring it on!